I know I have been poking fun at my mother for years, telling you that she is a lousy cook, hates food, and is very thin. Well, this still all rings true. Nothing has changed. If you like Delmonico steaks well done and chicken breasts baked for 2 hours, then dinner at my mother's house will be a treat for you. This is the one thing my mother makes that is really good. It's easy as pie, and truly delicious. 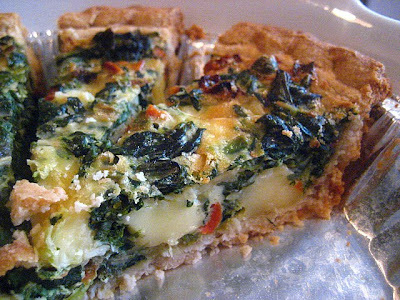 It is firm, not a quiche, and is great the next morning for breakfast. It is best made with ready made pie crust. A good non greasy brand and all natural one is Oronoque Orchards, if you can find it in the frozen section. (* if you can't find the Durkee fried onions, then you can use a packet of Lipton vegetable or onion soup mix instead, and omit the salt). Mix all ingredients together in a bowl and pour into your frozen pie shell. Bake in a 350F oven for about 40 minutes until the cheese is bubbling and the top is golden brown. This freezes beautifully and makes an easy dinner w/ a salad. I like to slice this into 10 thin slices and serve it as an appetizer. They say good cooks always skip a generation, as it did in my case. So how did you learn to be such a great cook with a mother who wasn't? Haha, cute post :) Love the pie! I've eaten this pie at Stacey's house and it's delicious! Her mother is delightful too. hilarious. well, at least you got this delicious recipe out of it! it looks scrumptious. mmm. crust. The fried onions totally make this for me. I loved them so much as a kid I used to get a can in my Christmas stocking every year. Love this pie. Thanks for sharing your mom's recipe. My mom wasn't a good cook either. But she had a couple of things that we always liked. My mother is known for a great pot roast and Irish stew. Besides that, some specialties of my childhood were creamed tuna and peas on toast and Franco-American spaghetti with hot dogs! Ugh! Cute post and the spinach pie looks delicious! How fortunate for your husband that you learned to be a great cook! Pretty funny description of dinner at your mom's house. I'd definitely eat this pie-- like several pieces of it. LOVE, LOVE, LOVE spinach. I could eat it everyday. My mom is a great cook - does that mean I am not? :) She has a love/hate relationship with food and is also very thin. What crazy women we descend from. But doesn't your mom also make good mandelbrot? my bro. had some and he liked it.